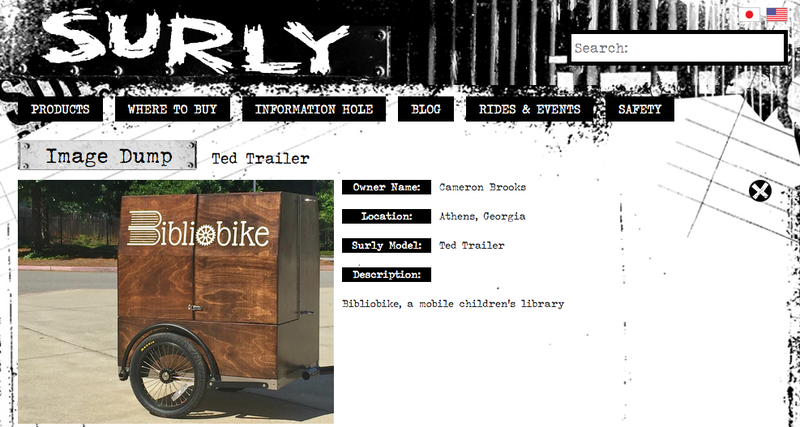 Bibliobike – Page 2 – Bibliobike will provide quality literature to kids from low-income families throughout the summer in Athens, Georgia. The Rocksprings Homes public housing units were built in 1955. While she unloads everything, once again, I explain what I’m doing. She likes the idea and invites me to set up inside (where there’s air conditioning). The kids finish up their lunches while I coordinate with the camp counselors. Each one has a mix of around seven elementary and middle school age kids for the day, and the groups rotate through to choose books. Within a twenty minute whirlwind, forty-two kids select books. Deliveries to the Rocksprings Community Center are unlike any other because there are simply so many kids. After just two deliveries so far, fifty-seven books have been given away. Click here to learn more about the history of public housing in Athens. Broadacres Homes is located on the corner of Rocksprings and Broad (near Gresham’s Disco). Just after pulling into Broadacres Homes around eleven thirty, a former student with a great big smile walking with a friend calls-out, “Hey Mr. Brooks!” I ask where lunches are distributed during the summer. A familiar face is a good sign on the summer’s first delivery. A white Athens Housing Authority van pulls up to the community center, then two men unload large plastic bins and carry them inside. The containers are filled with lunches Athens residents can pick up between noon and one. This Athens Housing Authority van delivers lunches to sites all over town. Yes, she wants the Mandela book, I think to myself. “You’ll learn about him in time. Get something you know about,” the woman responds sternly. The curious reader chooses Diary of a Wimpy Kid and Green Eggs and Ham. Logically, turnout last year was sporadic when the temperature hovered in the upper nineties or higher. Some days, two sweaty kids braved the heat for books. On milder afternoons, many more walked away with summer reads. So the haunting question throughout this year has been how to give away more books. When homeroom teachers around Clarke County were given the Summer Food Service Program flyers to send home before school let out, the issue of low turnout during Bibliobike deliveries was potentially solved. The plan is to arrive when lunches are being distributed. Before or after kids and families get their meals, they will also be able to grab some books. I toured the Broadacres, Rocksprings and Lay Park neighborhoods on May fifth to get a feel for resident density and find routes that minimize the number of hills. I snapped some photos, and if the ones above are any indication of the need for books in these communities, it’s going to be a successful summer. A couple photos were sent to Surly Bikes a few months ago, and they’re now included on the website’s Image Dump. Click here to see how other folks from around the world use their bikes and trailers. Linda’s serendipitous email last week couldn’t have been more timely, as the process of organizing this summer’s books had just begun. She offered to donate a large collection of used children’s books already sorted by by age, which will save a significant amount of energy when it’s time to load up the Bibliobike in a few weeks. It took two trips to transport the collection, which now occupies a considerable amount of space at the house. Many thanks to Linda for reaching out, and to everyone working to help folks in need. When we commit to the well-being of others, it’s curious how quickly compassion spreads. Protected from winter elements, the rig’s now a curious part of our classroom library (the most frequented section by this year’s crew of graphica fanatics), where it houses a growing collection of graphic novels, comics, zines and DIY books. Thanks again to everyone for contributing time and money, and to those who continue donating books for next summer’s deliveries. Please keep them coming. As the temperature climbs and more and more water is required to replenish ounces lost en route, I wonder how much weight I’m hauling every time I pass this sign at a moving and storage company on Old Jefferson River Road. Making good time on the way to Amethyst and Elkview, I pedal onto the scale. When a man in a baseball cap and beige cargo shorts steps out to greet me, I ask how sensitive the scale is, and whether or not it would work for the Bibliobike. He says it’s accurate within twenty pounds, “So it should.” He walks back inside. When he returns, he says, “Including you, a total of four hundred pounds.” No wonder. On the way back, I stop and forage.